Pet Enclosures Northwest are licensed, bonded and insured general contractors and can construct almost any type of pet habitat you like. If you need an outside kennel made of treated lumber sunk in concrete with a wire mesh or other type wall, we'll be happy to build that for you. If you need a small custom-made inside enclosure for your pet, we can do that, too. Our favorite construction is a maintenance-free enclosure made out of galvanized or stainless steel wire mesh with pathways made out of cedar planks. This is a rugged construction that gets its rigidity from the heavy-duty wire mesh and the solid planks that hold it together. 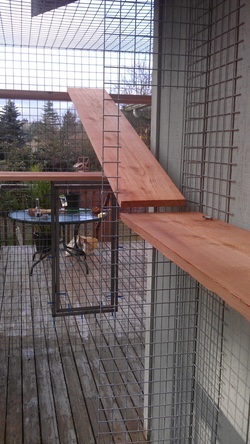 Unlike products that are solely designed to keep cats or dogs contained, this construction will protect your pet from predators like raccoons or coyotes. Pet Enclosures Northwest makes large outdoor enclosures, small outdoor enclosures, but also window enclosures, all of which allow your pet to enjoy the outdoors from a protected space. And with a water-resistant cover on the roof your pet will want to spend time outside even when it's raining. If you are worried about your resident coyote or friendly neighborhood raccoon looking for a meal, this is the right solution for you. And if you're a bird lover who wants to keep your cat away from those fine feathery friends, look no further.